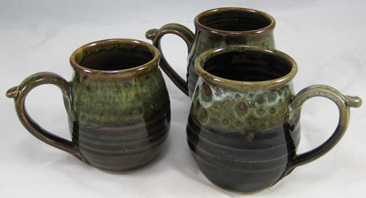 Made with regular stoneware clay this mug has a spotted mottled brown/tan glaze at the top running over a mottled brown at the bottom. 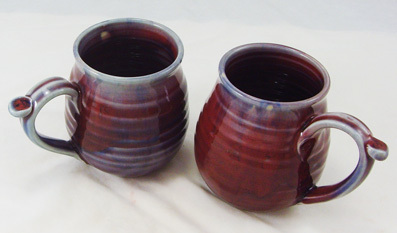 Made with porcelain clay these mugs have a glaze that is turning blue purple and red on depending on how they sat in the kiln. Each mug will be unique as this glazing always produces a slightly different outcome. This firing turned out with more red then purple or blue. 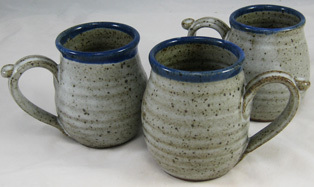 Made with high iron stoneware clay this mug has a stony gray glaze with a blue rim. 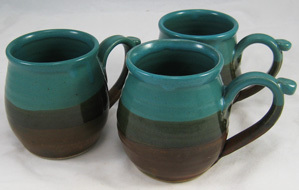 Made with regular stoneware clay this mug has a teal glaze at the top a brown glaze at the bottom and where they overlap it turns mussy green. 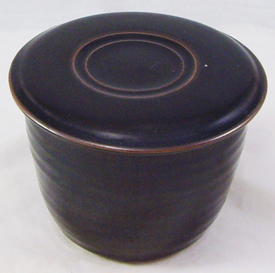 This French Butter dish is made with porcelain clay and a black glaze. 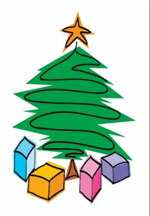 May show some brown or black/gray. 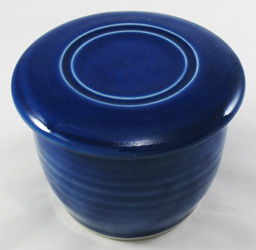 This French Butter dish is made with porcelain clay and a cobalt blue glaze. 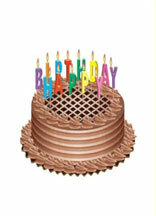 The glaze is very consistent from one firing to the next and turns out with a mid range blue, not dark or inky.